After a debate that stretched for more than five hours, the Texas House passed a bill allowing the open carry of handguns in public places 96 to 35. Texas is well on its way to allowing the open carry of handguns in public places after House lawmakers took an initial step to approve it Friday. After a debate that stretched for more than five hours, the chamber passed House Bill 910 from state Rep. Larry Phillips, R- Sherman, on second reading, 96 to 35. It would allow license holders to openly carry their handguns in shoulder or hip holsters. Similar legislation has already cleared the state Senate, and Gov. Greg Abbott has pledged to sign any open carry bill that reaches his desk. The House is expected to pass the bill finally as early as Monday. The vote came over the protests of Democrats, who offered amendment after amendment to the legislation. The Republican majority shot down efforts to require stronger holsters, badges and deeper background checks in order to carry a gun. They also rejected attempts to allow cities to opt out of the law, close a loophole in the law that allows handgun permit-holders from other states to openly carry their firearms in Texas and simplify the signage requirements for business owners who want to ban guns on their property. But the most contentious exchanges of the day came between Republicans themselves. 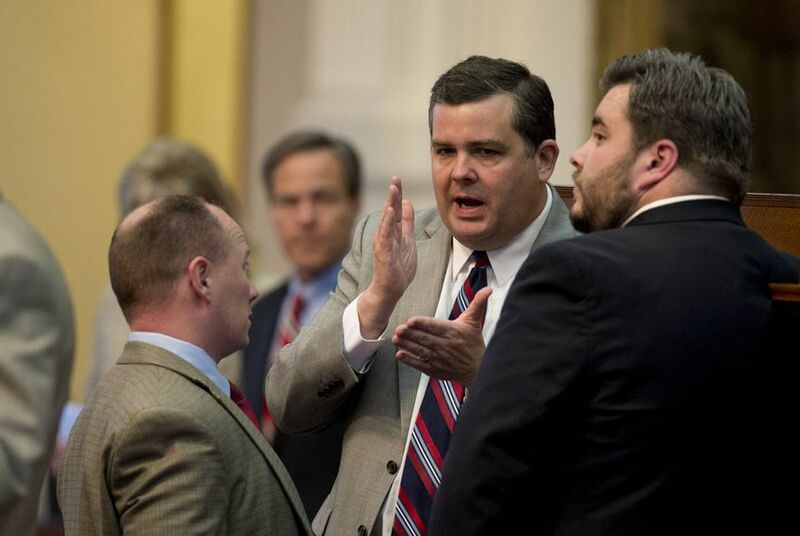 State Rep. Jonathan Stickland, R-Bedford, took the floor debate as an opportunity to repeatedly demand public explanations for why House leaders had rebuffed his attempts to repeal handgun licensing requirements altogether. Stickland, who objects to the fees and restrictions the permitting process imposes, has vowed to bring so-called “constitutional carry” for a vote on the floor. Unable to get a committee hearing for his bill, he must try to tag it on to a related piece of legislation as an amendment. “Representative Phillips, are you aware that someone else has filed a bill that they care about, that 100,000 Texans have signed a petition for, held six rallies at this Capitol and have been lobbying the legislature for a hearing in your committee for months?” Stickland asked. He had earlier accused Speaker of the House Joe Straus and his top lieutenants of “single-handedly” obstructing his provision when he was told the House parliamentarian had ruled that his measure was not germane to the open carry bill. Phillips told Stickland that he had himself — and the Senate — to blame for his bill not advancing.